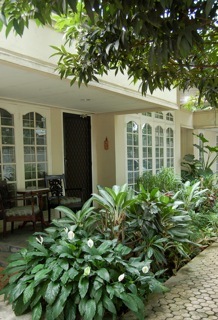 The Maritim Guest House: When in Jakarta, why stay anywhere else than The Maritim Guest House? Why stay anywhere else in South Jakarta? With the accommodation, breakfast and services included in our room rate, we have tried our best to add as much value for money in our package. I have managed hotels for many years and have trained our staff which helps make our operation efficient, probably better than many other similar properties in Jakarta. We are casual and friendly and strive to ensure our guest stays are pleasant. We never pretend to be perfect and we do our best to quickly rectify any shortcomings identified by guests. For example, recently a guest informed us in the morning that his air conditioner was not very cool. By the time our guest returned, he was surprised to discover a new air conditioner had been installed as it was determined by our trusted air con technician that the air conditioner had some serious problems justifying we install a new unit. Ita and I are directly involved in our guest house, we usually do not leave our guest house for others to run. Ita, of course, speaks Indonesian and English, I obviously speak English and some Indonesian, I should speak Bahasa Indonesia better! Our staff also speaks English. So communication is generally not a problem, that is, as long as you speak Indonesian or English! 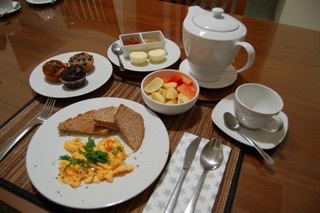 Our guests enjoy both our western breakfasts, Indonesian breakfasts too. Our homemade carrot cake, banana bread, scones or muffins are some examples of what is served with breakfast. We make our own whole wheat breads, yes we do, which toasts up nicely and goes great with salted French butter and our homemade mango jam or pineapple jam. Our coffee is a great blend of locally roasted coffee beans that is usually enjoyed by those powering up for the day. We constantly receive praises for our food prepared by our Javanese cook. Dinner is offered on advance request and is charged at only Rp100,000 nett. 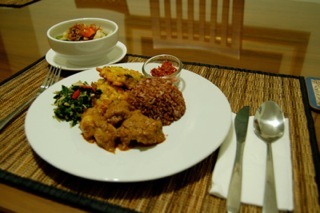 We offer Indonesian food, prepared and presented in a tasty way. It is unusual for us to receive anything but praises for the meals we prepare. We try our best to adjust our offering to guest preferences as much as we can. 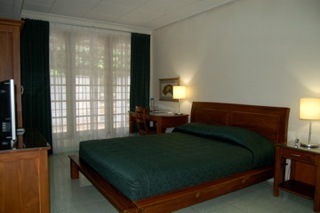 If a homey and comfortable stay is what you are seeking, please look no further than The Maritim Guest House. And thanks for reading this.